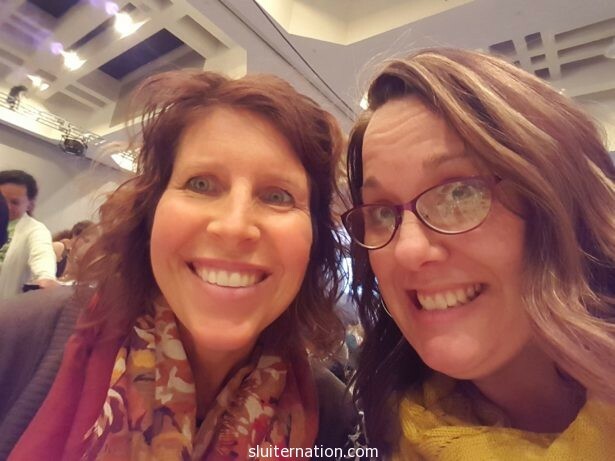 The weekend before Thanksgiving I got on a plane and went to Atlanta for back-to-back English teacher conferences: NCTE (the National Council of Teachers of English) and ALAN (The Assembly on Literature for the Adolescence of NCTE). It was an excellent experience, but man. I am so lame at traveling away from my family! I left Friday morning. The whole family drove me out to the airport for my 8am flight (which means we left the house around 6am). Eddie–who is just a tad like me–had been worrying over my leaving all week. He kept saying things like, “This is the LAST time you will put us to bed” and “This is the LAST time you will eat dinner with us.” He is a bit melodramatic. I assured him I was going to Atlanta, not Heaven, and that I would be back home Monday night after they were in bed. He clung to me at the airport, not really wanting to let me go or say goodbye. Alice followed his lead and hung onto my leg or wanted to sit on my lap. I think she could sense that they were leaving me behind. I gave Cortney a long hug…both because it’s hard for me to leave him and because I knew it would be a long four days of parenting by himself. I hugged and kissed my three babies one last time, and I was off through security. 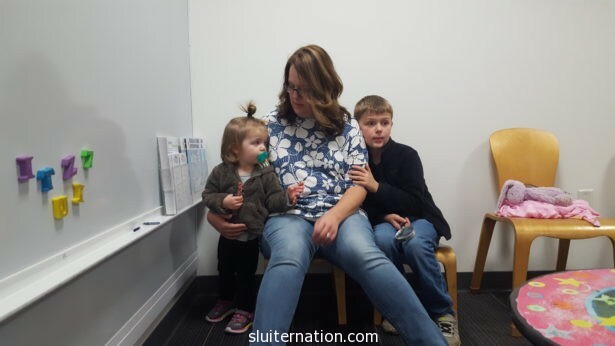 This was my third time flying solo for a conference; the first two times were to California for BlogHer ’11 and BlogHer ’14 (I was pregnant both times). 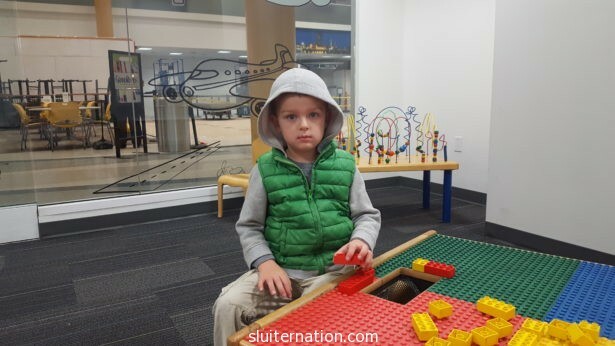 Both trips to California involved multiple airports and connections and layovers, so a direct flight that was less than two hours long to Atlanta felt like nothing! Although I will say the Atlanta airport is HUGE. I mean, I took a train inside the airport to get from one end to the other where my bag and the exit was. Crazy. I must say, I am proud to be getting pretty adept at getting myself a taxi and having great conversations with the driver. I had a remarkable political discussion with my driver who was from Kenya. She was listening to a very conservative talk radio station and must have sensed my tension (I just opened a book and started to read), because she said, “You must wonder why someone like me wants to listen to something such as this.” And then she went on to say she listens to all of it: left, right, and in between. She wants to be informed. She talks to other immigrants who are now citizens–like she is–to hear their perspective. I dare say it was one of the highlights of my trip! 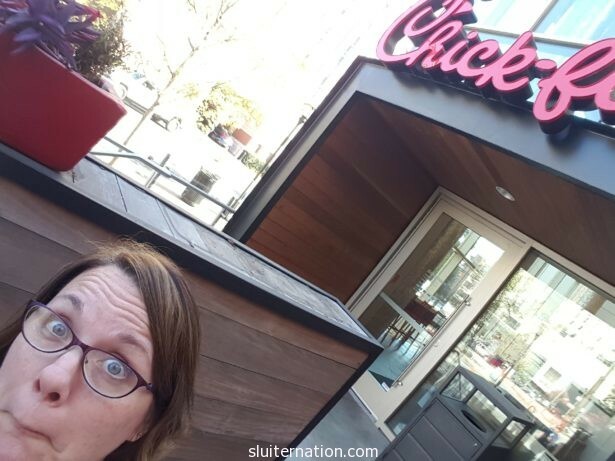 Well, that and the fact that I tried Chick-fil-a for the first time (and ate there three times in four days…what? It was right across from my hotel!) SO YUM! Friday was a whirlwind of travel, hotel, lunch, exhibit hall (where I met authors and got free books!) and going out to eat with my editor and fellow contributor at The Educator’s Room. 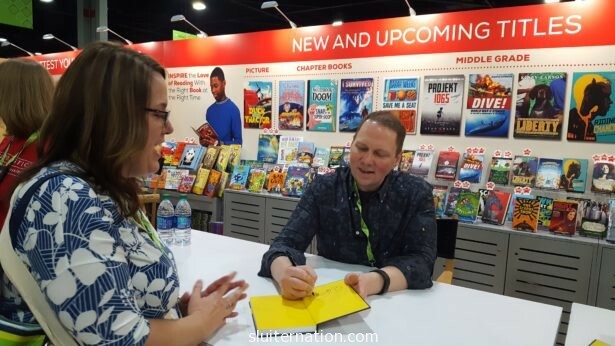 Oh, and one of the author’s I met on that very first day was Dav Pilkey–you know—the guy who wrote the Captain Underpants books? Eddie and Charlie about died when I texted Cortney this photo of me getting the first book in his newest series, Dogman, signed. And yes, I am talking too much. I was telling him about how my boys LOVE his books and that we are in the middle of re-reading them RIGHT NOW at bedtime. Like I said, my editor at The Educator’s Room was there–she is local to Atlanta–so she picked my fellow contributor Colette and me up for an early dinner. We went to a place called Six Feet Under. It’s across the street from a large cemetery, naturally. She ordered us something called Spicy Rat Toes–jalapeños stuffed with shrimp and wrapped in bacon. Oh my gosh. So good. 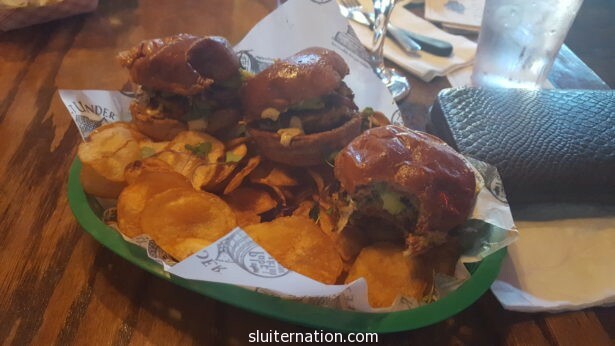 Then I got the crab cake sliders for dinner. 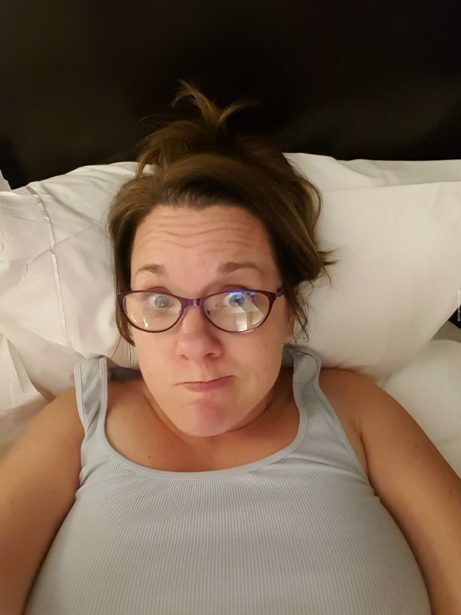 I was so exhausted by the time I got back to the hotel room. I flopped into my jammies before 7pm. In fact, since my roomies were still out, I called home to talk to my loves after a long day away. The boys were super excited to talk to me. Charlie asked if I was coming home now with the Dogman book. I could hear Alice in the background being confused about hearing mommy’s voice, but not knowing where I was. It was good to hear everyone, but because I was so tired, it also made me sappy and wish for my own bed. Thankfully the roomies came back shortly after and we chatted and laughed until bedtime. Saturday was my big day of sessions. I was part of a round table at 9:30am that included authors Meg Medina and Kekla Magoon (both excellent YA authors. I suggest grabbing everything they’ve written for you To Read Pile). I then attended a session about the narrative of The Other in literature and in our students’ own narratives. After lunch, I joined back up with Educator’s Room co-writers and presented about using blogging and social media to advocate for teachers. I ended the day in a session about making nonfiction more accessible (and exciting) to students. I ended the day meeting my three roommates (one of which is one of my best friends, The Pastor’s Wife) for the annual Scholastic Dinner. Scholastic invites anyone who wants to attend to have a full-on turkey dinner together. It was pretty sweet. Plus there was lots of laughs and good conversation. After dinner we went over and watched an interview with Ta-Nehisi Coates (correspondent for The Atlantic and author of the novel Between Me and The World). While way brief (I blame the interviewer), it was worth hustling out of the Scholastic dinner and down to the auditorium to hear him speak about the presidential election and what is happening in society from his point of view. Sunday was more exhibit hall, Chick-fil-a, and then that evening was the Author Reception for the ALAN conference that began the next day. 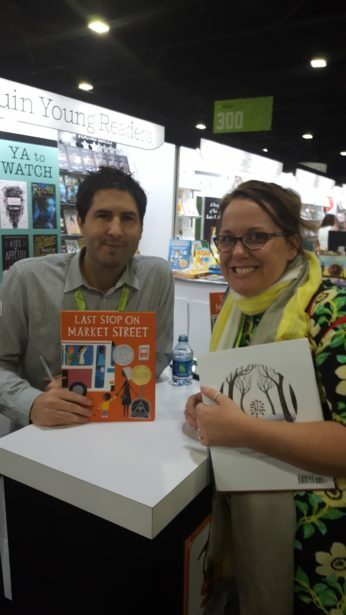 The highlight of the Exhibit Hall for me was a tie between all the free Advanced Reader Copy books I got and meeting Matt de la Peña and having him sign a copy of Last Stop on Market Street for my kids. Let’s not talk about my bad hair, mmkay? As I said, the evening brought the Author’s reception and I will fully disclose at this point that I went a little fangirl on my favorite YA authors. I met Jason Reynolds and Brendan Kiely (All American Boys), A.S. King (Please Ignore Vera Dietz), Laurie Halse Anderson (The Chains trilogy, Speak, and many more), David Levithan (Two Boys Kissing, Every Day, Another Day, and more) and others. It was a crazy two hours of conversation and selfies. I think there were appetizers and drinks too, but I was too distracted to stand in those lines. After, The Pastor’s Wife and I went out for BBQ with some colleagues from universities around the country. We had fabulous discussions about YA over chicarrónes. I had an American mule while splitting brisket and pulled pork while talking religion and love. It was glorious and a definite favorite part of my trip. Monday was my last day, and the day I got to attend the ALAN conference. As you can see, it was a bit overwhelming. They handed me a box and a bag FULL of books. 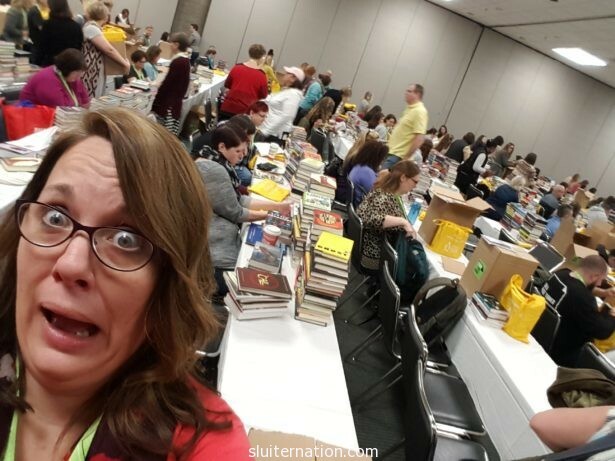 There were 500 people in attendance all sorting through their books deciding what to keep, what to get signed, what to trade. It was the most beautiful chaos I have ever witnessed. I was privileged to spend the day surrounded by books and listening to YA authors. I am positive that this must be what heaven is like. After shipping four boxes of books (I counted 88 when I unpacked the ones for my classroom…and there were quite a few picture books and elementary chapter books I kept for my kids on top of that…so probably over 100 books total), we grabbed one more meal of Chick-fil-a before getting an Uber to the airport. The flight and everything was smooth and on time and I was on my own couch by 11pm. 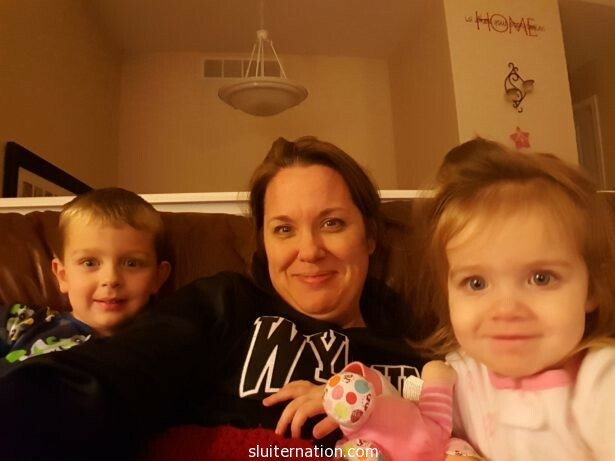 I sneaked into the rooms of my children and gave kisses as I tucked them all back in. Tuesday evening after school and running around, these two small people stuck to my side like glue. I think they were afraid I would go away again. I was cool with it; I missed my littles. Cortney an I were in constant text or email the whole weekend. My roomies thought it was funny, but I am just so bad at being away from their lives! I will say it was a wonderfully awesome trip! I hope to go again next year when it’s in St. Louis! If you’re interested in more of my professional highlights, I wrote about it at The Educator’s Room.